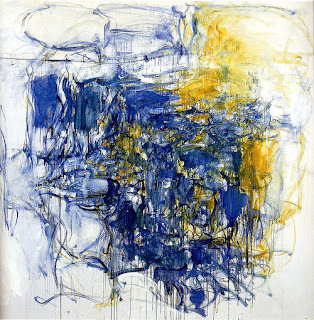 Patricia Albers' "Joan Mitchell: Lady Painter"
An informative biography, full of details about Mitchell's family background (Chicago steel heiress), love affairs and artistic struggles. Her competitive desire to be "one of the boys" of the New York School. Her fear of abandonment and death. Her steadfast love of van Gogh. She painted from the memory of a landscape, until she abstracted it in the idiom of Abstract Expressionism. The writing of the biography is in places too breezy and purple for my taste. The biographer clearly admires her subject, but does not hide her flaws. "A new kind of cine-love"
PL and I visited El Museo del Barrio yesterday to see its 7th biennal show. I've been to the museum before, to see a show about the artistic connections between Puerto Rico and New York, but hadn't seen a biennal there. 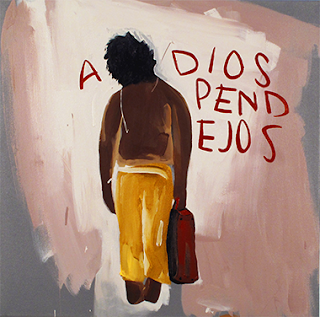 37 emerging Latino and Latin Americans who live and work in the New York metropolitan area contributed works. As expected, video works and installation pieces dominated, most of which were thin in conception and casual in execution. To display one's process does not necessarily make a successful artwork. The aesthetics by and large felt derivative. But how does one surmount the problem of coming late to the scene? 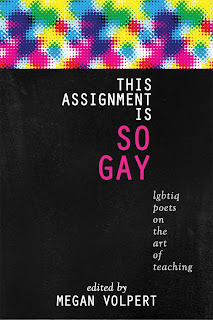 Just received my contributor's copy of This Assignment Is So Gay: LGBTIQ poets on the art of teaching. Proud to be out with Gregory Woods, Cyril Wong, Timothy Liu, Benjamin Grossberg and Garth Greenwell. Megan Volpert edited and Sibling Rivalry Press published this important anthology. It will be launched at the Decatur Book Festival in Decatur, Georgia, in September. I will be reading and speaking on the panel with Megan, Bryan Broland and other contributors. There are two major challenges facing any biographer of Melville, as Delbanco frankly admits. The first is the paucity of surviving documentation such as correspondence and notebooks. Delbanco overcomes this deficit to some extent by sketching in the historical picture, with some nice descriptions of New York City in the 19th century, for instance, and by delineating the debate over slavery in the lead-up to civil war. I loved the show of Richard Serra's early work at David Zwirner. It is full of feeling for material, volume and balance, the hallmarks of his mature achievements. My favorite work at the show was a lead plate made in the form of a canvas sheet that has been folded into four quarters and then unfolded. On the second floor were Blinky Palermo's works on paper, which he did near the end of his all-too-short life. Many of the drawings were composed in series, a feature that emphasizes his constant experimentation with color, geometric shapes and brushstroke. 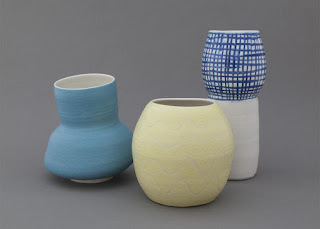 Even though they allude so familiarly to abstraction, Minimalism and Conceptual art, they retain an irresistible freshness.